What does Transparency in fashion mean to you? I’ll skip the usual long winded apology for not blogging in a while and skip to what I have been doing while I’ve been away and how I feel I can make this blog more relevant for today. I was in Tesco today and the woman in front of me was at the magazine aisle saying there were no magazine for the modern woman. I’m not sure what this mend to her but to me I understood it as there are no fashion magazine that cater for growing concerns of the modern consumer (is it even appropriate to call our self a consumer). I realised that fashion magazines seem to avoid the eco questions and if they do write about it they seem to trivialize the issues. As a ‘consumer’ my self I look for cloths that both fit my needs and my concious. Fashion designer aren’t going to start catering for these desires other night but one way which us the consumer can do is only buy garments that we love. As Vivienne Westwood said “Buy less, choose well”. What she was saying here is that the key to sustainable fashion is choosing well, choosing garments and accessories which you are going to treasure. In the future I plan to blog about designs which have a sustainable ethos but also designer which I feel can hold a treasured place in your wardrobe. As a student my budget isn’t exactly high, so on the most part I will be sharing vintage, charity shop and high street where I feel choices have been made with longevity in mind. As a fashion student eco fashion has been becoming ever more important in my practise. I wish to learn and seek more information on the subject and as I do I will be sharing it with you as I feel like knowledge however small or insignification it may be should be shared. I am interested in the concept of local fashion and what this means from a sustainable point of view. Local fashion not only means you are supporting local talent but you are also supporting the local economy. Local fashion is more sustainable as you know that people aren’t being exploited in the process of getting the product made. Local fashion is a small step towards a more sustainable future that is still fashion forward. As a fashion student I know all to well the importance of trends and I feel it is important to show you the trends but to make it workable in a more sustainable way; whether through DIY, thrifting or local fashion. I think its fair to say that I am passionate about fashion and making fashion sustainable. But another of my passions is travel. I feel that travel and fashion fits together well in a blog as they are both lifestyle choices. This will also give me the opportunity to blog about local fashion based on what I have learnt from my travels. Since I’ve been away I’ve been to both Brighton and Calais, so await the blog post to follow. I just wanted to share with you this cute hair pin that I brought at Clutter City Spring Market at the Norwich Arts Centre, Norwich (http://cluttercity.co.uk/). 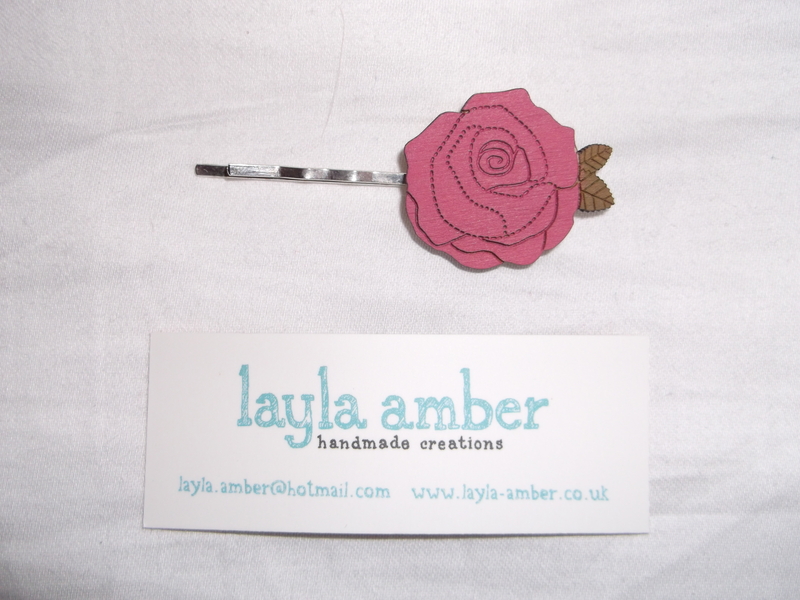 It is by the talented jewellery designer Layla Amber (check out her website: http://www.layla-amber.co.uk/). After studying Graphic design at Norwich University College of the Arts (now NUA) she started to experiment with her illustration by turning them into jewellery and soon after Layla Amber Jewellery was born. Her jewellery is somehow effortlessly simple and marvellously detailed. I couldn’t not support this British designer with her beautiful designs. Its important that we support the growing talent in Britain not only does it hold up the british flag and support our economy but it also means you get something more unique and individual. This cute wooden and metal hair pin only cost me £3 so not only is it stylish, it doesn’t break the bank. It fits in perfectly with this seasons floral trends but its also a classic piece that can work time other again.